Beautifully engraved certificate from Silverzipper.com, Inc. issued in 2001. This historic document was printed by the Secuity-Columbian United States Banknote Company and has an ornate border around it. This item has the printed signatures of the Company’s Chief Executive Officer, Paul E. Palmer, and Secretary, and is over 10 years old. Saber Capital, Inc. (the "Company") (OTC BB:SBCL), a Nevada corporation, approved for trading on the NASDAQ Bulletin Board, trading Symbol "SBCL", announced today that it has completed the acquisition of silverzipper.com, Inc. (silverzipper), a Delaware Corporation and silverzipper's wholly owned subsidiary, Robern Skiwear, Inc. (Robern). After the acquisition, the shareholders of silverzipper become the holders of approximately 74% of the 2,824,200 issued and outstanding shares of Common Stock of the Company. The Company will change its name from Saber Capital, Inc. to silverzipper.com, Inc., and move its principal offices to the Empire State Building, 350 Fifth Avenue, Suite 1222, New York, NY, 10118. The silverzipper business model is growth through acquisition in the sports apparel/accessories and active wear markets and sales of its trademarked niche brands as a preeminent Internet retailer of this product category. The Company's strategy is to supply proprietary brands of fashionable, high quality sports apparel/accessories and active wear directly to the consumer at wholesale prices via the Internet. The Company's initial products are sold by Robern Skiwear, Inc., a designer and marketer of snowboard clothing and skiwear ("Drift" and "Ski Gear"), with annual revenues of approximately $7,000,000. Management consists of a seasoned team with over 75 years of experience in the apparel industry including, Paul E. Palmeri, CEO , former President of Robern Apparel, Inc. and Frank Lipiro, President, former Senior Vice President of Starter Corp. The Internet sales effort is supported by two consultants, Jordan Schachter who has consulted for AT&T, L.L. Bean, C D Now and Ameritrade and Chris Nelson who worked on Internet marketing for Cannon, Fox Entertainment and American Express. The Company's website, silverzipper.com is expected to be active in October of this year. 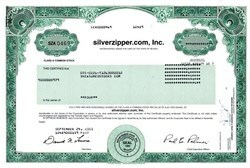 Silverzipper.com, Inc. filed a voluntary petition under Chapter 7 of the U.S. bankruptcy code on 08/06/01. In April, Silverzipper.com, Inc.'s. primary credit facility, Merchant Factors, Inc., had declared a default on Robern Skiwear, the company's subsidiary and seized related collateral. Since the assets of this subsidiary represented the company's remaining business, Silverzipper.com ceased its operations immediately. silverzipper.com, Inc. manufactured skiwear and snowboard apparel for wholesale distribution throughout the United States and Canada.